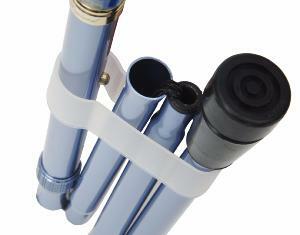 An unobtrusive device for holding folding canes firmly in the folded position when not in use. This size fits standard diameter folding canes (diameter of narrowest section: 19mm). Simply squeeze the clip slightly, insert the folding cane ferrule-first, and ease the cane into position.